Having the right tools for the job makes a big difference when working on firearms. An armorer’s block is no exception. 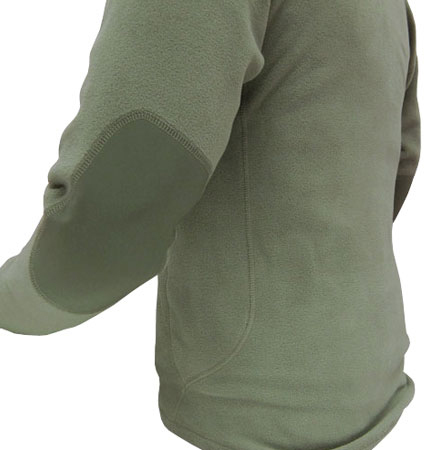 It is especially useful for removing pins, working on a frame, and routine maintenance. 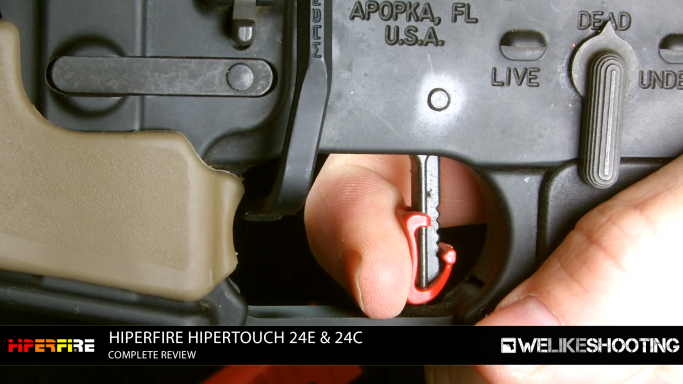 The Apex Tactical Specialties Polymer Armorer Block is the perfect addition to any gunsmith’s toolbox, and I believe this product offers a lot of features in its design for the price point of $29.95. 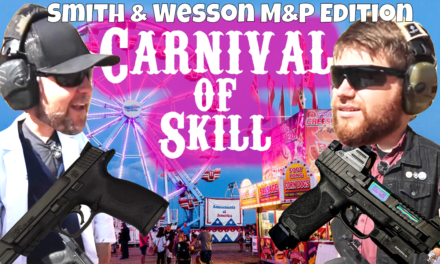 The design of this product gives you the ability to securely and safely work on not only the entire Smith and Wesson M&P pistol line including the Shield model, but the entire Glock pistol line as well. 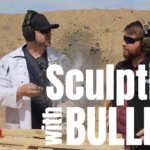 In my opinion this particular armorer’s block is extremely versatile for not only the private firearm owner, but for gunsmiths, law enforcement, military, and shooting ranges where they offer firearm rentals. So how does it accurately fit the contours of these different striker fired models? I was wondering about that too. At first I was skeptical, but after seeing how the moveable bosses slide in their tracks, it all made sense. 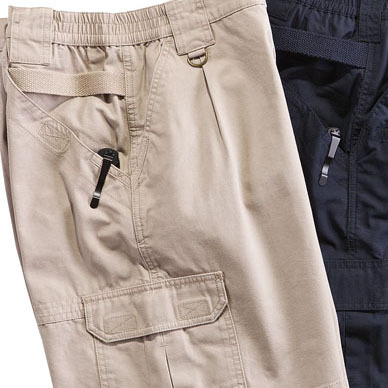 After you loosen them, slide them against the frame, and then finger tighten. 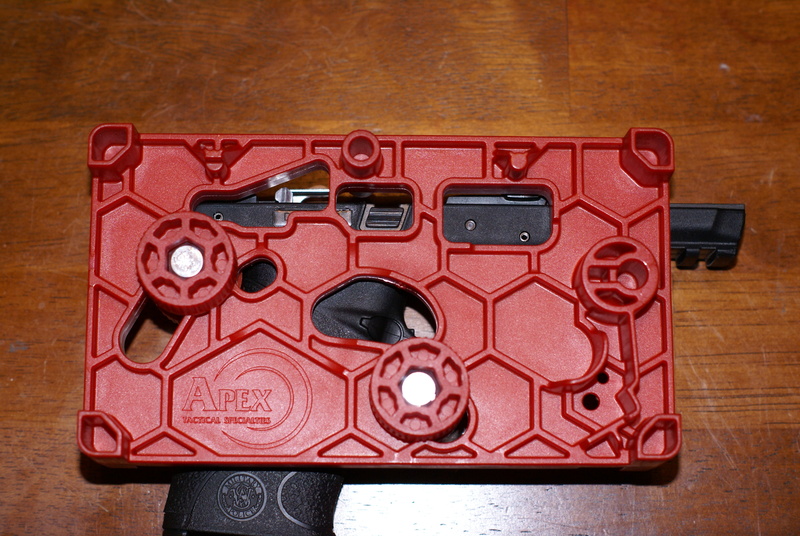 Since the block has an identical setup on the opposite side, it allows you to work on either side of the firearm. 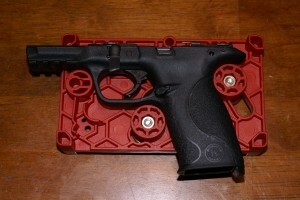 The cutouts in the block are to facilitate the removal of pins, magazine release, slide release, and the manual safety. 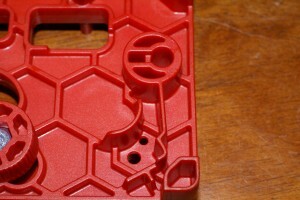 There are also areas for working on the trigger and strikers. 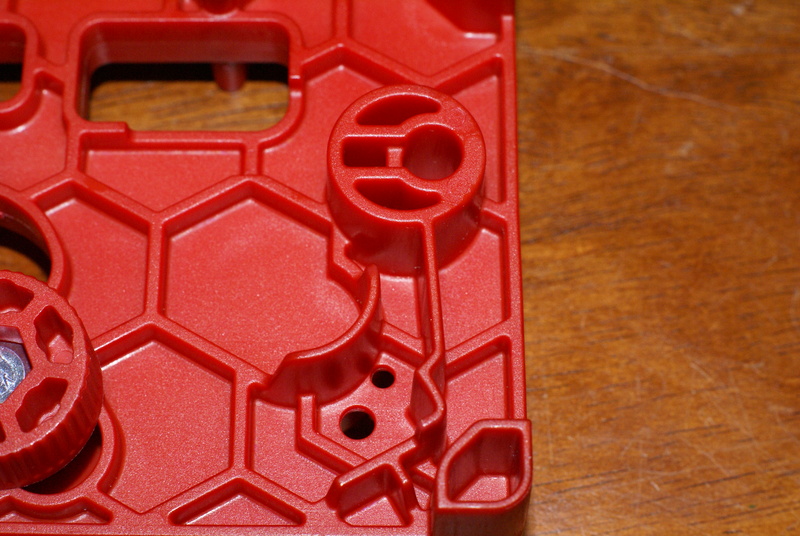 In the polymer design you can see honeycomb ribs, which give this unit strength while keeping it as light as possible. 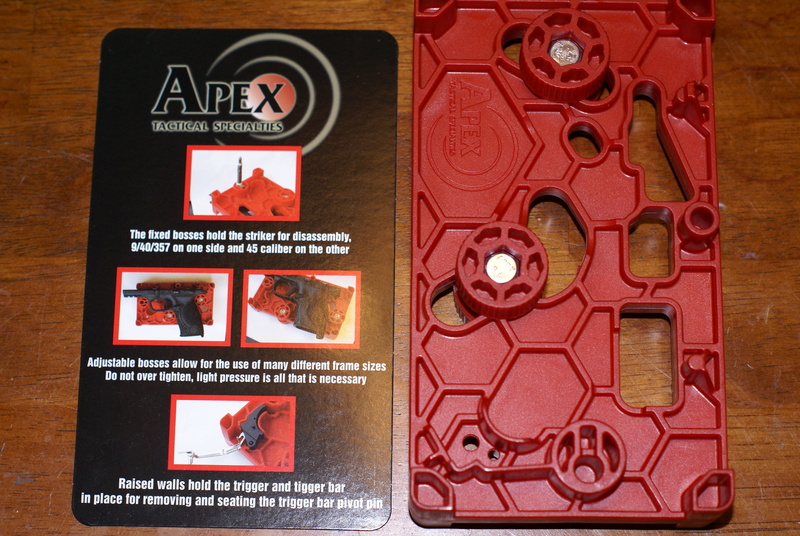 Inside the packaging, you get the armorer’s block and an informative insert. You can see how the moveable bosses work, and how you can still work on the striker (middle left) and trigger assembly (bottom left) with the frame in the block. 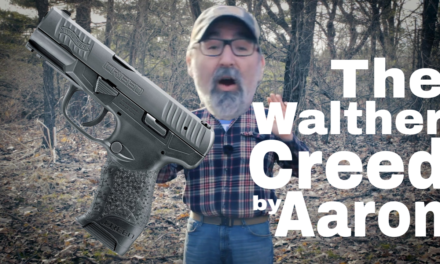 One great feature is that you can work on either side of the M&P or Glock pistol. In this image, you can see the cutouts for the magazine release, pins, slide release, grip pin (Glock models) and thumb safety (not shown on this model M&P pistol). 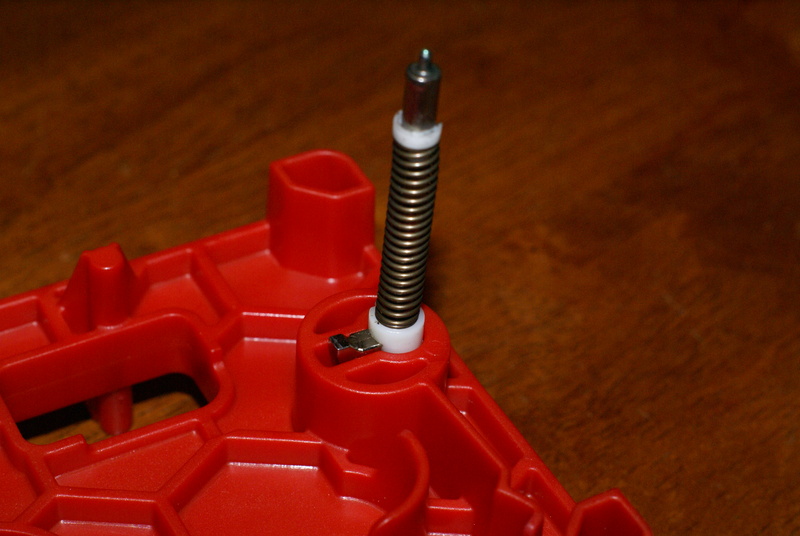 The take down of the striker is made easy by giving you two areas to securely insert the striker assembly, and compress the spring. One side of the fixture is for 9mm/357SIG/40S&W, and the other is for the 45ACP strikers. Another great feature is while the Glock strikers fit snugly, you can also position them in the corners of the block for their take down. The striker is held firmly in place, and makes spring removal easier for maintenance or replacement. 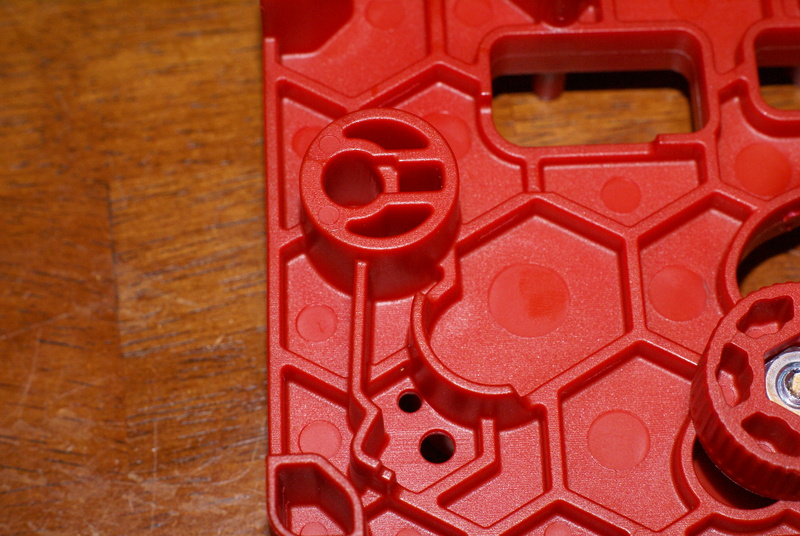 The corner works well for the Glock striker assemblies. The front (Apex logo) will fit 9mm/357SIG/40S&W strikers and triggers. The back of the block has positions for the 45ACP striker and triggers. You can see the difference between the two when compared to the previous photo. Compared to other armorer’s blocks that I have used in the past, this product by Apex Tactical Specialties is the best yet. It’s easy to use and the design allows me to do multiple jobs on one fixture, saving me time and money. As simple as this unit seems, you can see that they really thought this one out. Everything on this fixture serves a purpose, and its compact size (7″L x 4″W x 1.5″T) makes it easily portable and doesn’t take up a lot of room when in use or in storage. 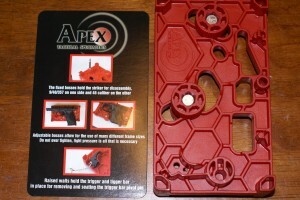 The Apex Tactical Specialties Polymer Armorer Block has become a regular use tool for me. I would highly recommend this product to anyone looking for a better option than working on a less than ideal surface, such as directly on a workbench. It’s well worth the affordable price of $29.95, and hasn’t given me any issues… only results. In addition to this already available product, there will be a stand packed with more great features for the armorer’s block coming out in time for Christmas (2013). I’m really looking forward to its release, and getting my hands on one.